Vaccarese is perhaps best known as one of the allowable grapes used for blending of the red wines in the Chateauneuf du Pape appellation. The dark skinned berry is also known as Brun Argente, its original name. The grape takes its name from the brownish hue of its skin and the almost silvery color of its leaves, which is the translation of Brun Argente. 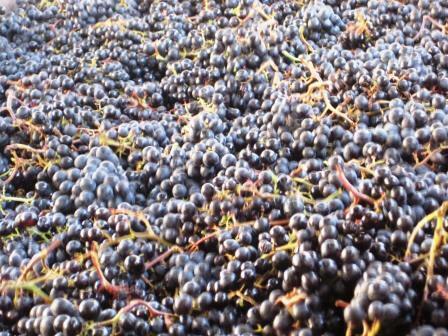 Vaccarese produces large bunches of grapes, which are quite compact. Coupled with the large size of the berries, it makes it difficult for bunches to get a lot of air, which can lead to rot or botrytis. The grape continues to lose popularity in the Southern Rhone Valley. Today, only 4 hectares of vines remain in Chateauneuf du Pape, give or take. Clos St, Jean is one of the few domaine’s that continue to use Vaccarese in the blend. When added to the blend, Vaccarese does not bring much depth of color. Instead it adds spicy, peppery qualities and a tannic, somewhat rustic backbone to the wine. Vaccarese is also planted in the Cotes du Rhone appellation where it can also be used to make Rose’ wine. It is very difficult to find wines using 100% Vaccarese. In fact, Vaccares is almost always used a part of a blend. As a wine and food pairing, lighter styled grilled or roasted meat courses like pork, veal, chicken or other white meat dishes would make the best wine and food matches as well as lighter cheeses.